Charley Harper handpainted needlepoint is adapted from the iconic art of Charley Harper (1922 - 2007), the famous American artist and illustrator. His artwork lives on in books, textiles, and now in needlepoint. These designs are easy to stitch and make wonderful framed pieces of art or needlepoint pillows. Each canvas has been expertly handpainted by professional needlepoint painters. needlepoint design measures 6.5" x 12". Sold canvas-only or as a kit. If you would like us to custom kit this Charley Harper handpainted needlepoint design for you, using cotton, silk or wool threads we would be glad to do so. We use Planet Earth fibers for our silk and wool selection and DMC embroidery floss if cotton is selected. 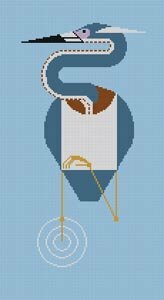 This Charley Harper Louisiana Heron canvas is usually in stock and ships within a few days. However, due to the popularity of Charley Harper canvases it is subject to back order so if you're in a hurry let us know.